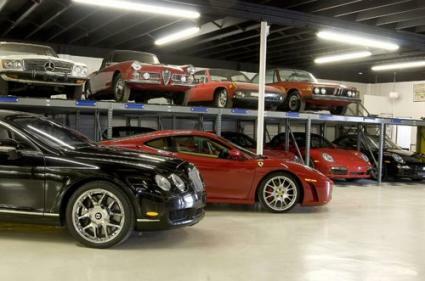 Vehicles stored at Dallas Car Storage. Ever wonder what to look for in a secure vehicle storage facility? Find out how to choose the right place for your car. People store cars for a variety of reasons. Frequently, cars are garaged for the winter to avoid damage from road salt or because they are seasonal vehicles like convertibles. Sometimes, exotic cars or classic automobiles are stored in a professional facility when they aren't in use. Some owners also choose to store cars if they are going out of town for a few months or if they are in the process of relocating. Regardless of your reason for storing a car, there are some basic things you'll need to know about selecting a facility. Do I Need Liability Insurance on a Car in Storage? Cars are major investments, and finding the right storage facility is a major decision, requiring a bit of homework. Ron Sturgeon, owner of Dallas Car Storage in Fort Worth, TX, says that many owners take the whole process very seriously. "Secure vehicle storage is very important," says Sturgeon. "It is like finding a day care for your child. We have people come meet us and look at our facility before making a decision on where to store their 'baby.'" Get referrals from friends and family members. Has anyone you know stored a car recently? If so, find out how they felt about the facility. Look online and in the yellow pages. Most car storage businesses advertise their services. You can call them up and interview the manager. Ask around at car clubs and local dealerships. These organizations usually know of businesses that specialize in vehicle storage. According to Sturgeon, choosing a facility is partially about sharing a passion for cars. His storage facility houses many of his own vehicles, along with those for DFW Drive Your Dream, his exotic car tour business. "We want to protect our vehicles as much as we want to protect our clients' vehicles," says Sturgeon. "Finding the right storage facility is about security, accessibility, and competitive rates." Signs of a secure facility include the presence of security cameras, good lighting and a safe feeling, and an alarm system. Facilities should also have a sprinkler system in case of fire. Avoid storing your car in a facility that doesn't meet these criteria. Sturgeon also says that it's important to pay attention to accessibility. Ask about the access policy, and use this information as a clue about the overall security of a storage business. "Facilities that have 24/7 access are a red flag," Sturgeon says. "When people are free to come and go at all hours with no supervision, bad things can happen." Instead, look for a place that has convenient business hours and is available at other times by appointment. You'll have to plan ahead a bit more in order to access your vehicle during off hours, but it will be worth the peace of mind. Besides choosing the right facility, there are a few things you can do to help protect your car while it's in storage. "Vehicles that are stored for long periods without being started or moved can cause problems," says Sturgoen. He recommends that people look for facilities that offer additional car storage services, like having technicians "start your vehicle once a month and let it idle for 10 to 15 minutes or pull the car forward and back it up to avoid flat spots on the tires." You can also prevent theft or break-ins by keeping valuables out of your car. Don't leave CDs on the seat, an aftermarket GPS device on the dash, or electronic equipment in the trunk, and lock your car to make access just a bit harder. The storage facility may or may not require you to disable your car alarm. With a little research, you'll find the perfect secure car storage facility for your investment. Doing your homework now will help put your mind at rest while your car is being stored.